George Paul Seguna began his career in 1960 as a member of the first class to graduate from Detroit Barber College. His first salon was inside the American Silhouette Health Spa at Fenkell and Grand River on Detroit's west side. Known for such innovations as wall to wall carpet (unusual for a salon of that era), all sessions were by appointment only. 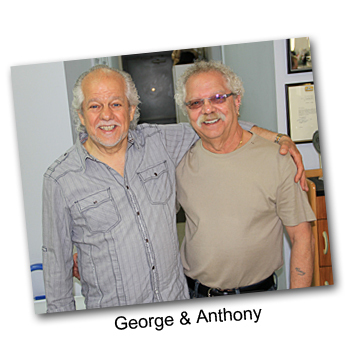 In 1971 George founded American International Salons with several locations. He further honed his craft by attending styling schools abroad. In 1977 he opened Hair by George Paul Exclusive, a full service salon in West Dearborn that remained at the same address for 31 years. In 2007 he moved to West Dearborn in the Dearborn Towers Condominiums, and a second location in West Bloomfield. George is a licensed Cosmetologist with a Masters License in Barbering. He comes from the island of Malta where his father owned and operated a 6 chair salon called American Salon. The family has a history of over two hundred years of professional hairstyling and there are still 12 members of his family that are full time hairdressers. His brother Edward owned Sir Edwards Hair Salons, back in the 70’s and early 80’s, and you’ll find his brother Tony still owns and works at Anthony’s Hair Inc. in Allen Park. George's writing credits include a book about hair, All You Wanted to Know About Hair and Never Got Ahead, a weekly column, Hair Today, and articles in local newspapers. Royal Tones, the Team Beats, Del Shannon, (hit song Runaway, Hats Off to Larry), Terry Knight and the Topics (later known as Grand Funk Railroad), Sun Liners (became Rare Earth), Ted Nugent (as Amboy Dukes), The Flaming Ambers, Chris Campbell (of Bob Segar's Silver Bullet Band) Holland, Dozier and Brian Holland and many of the early singers in the Motown era in 1960's. Norm Ullman, Mickey Redmond, Reed Larson, Sid Abel, Robbie Plumb, Dale Mccourt, most of the Red Wing players for over 25 years.